For E-patterns and downloadable products you should receive an email immediately with your link. If not please contact me or to ensure your automated delivery add (no-reply@desireesdesigns.com) as a contact prior to purchasing. Letters to Santa was introduced at Quilt Market and Festival 2017 and it was a huge hit! We originally designed it for the 9.5"x14" hoop but due to lots very persuasive people we have been able to make it also work in the 8"x12" hoop!! 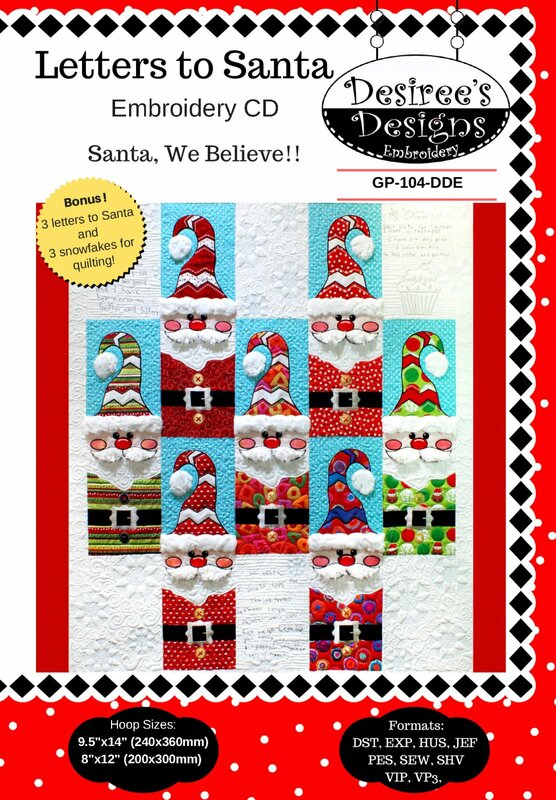 Now more of you can have this wonderful quilt for the Christmas Season. This Quilt is very unique as it can be very personal as well using faux fur for some of the elements. I love to think outside the box and this quilt is one of my very favorites. I digitized my grandchildren's actual letters to Santa and added them to the white areas of the quilt. These white areas would also be good for family recipes, a place for all your Christmas guests to sign the quilt, or a special spot for some beautiful quilting. We have included some letters just in case you don't have any of your own. We also provide suggestions on how you can personalize this quilt. We have also included tips and suggestions for how you can get your letters or recipes onto fabric so you can personalize your quilt too! We will walk you through how to work with faux fur or other textural fabrics to add some dimension and texture to your quilt and its completely optional. I love this quilt and I really enjoyed designing it and making it for you, I hope you enjoy it too! Merry Christmas! !